Regardless of how complex the process for setting and reporting on executive pay becomes, or how simple some critics believe the process should be, one truth reigns: money motivates. That was the theme when a panel of directors and compensation experts gathered in Atlanta for the Leading Minds of Compensation South event. 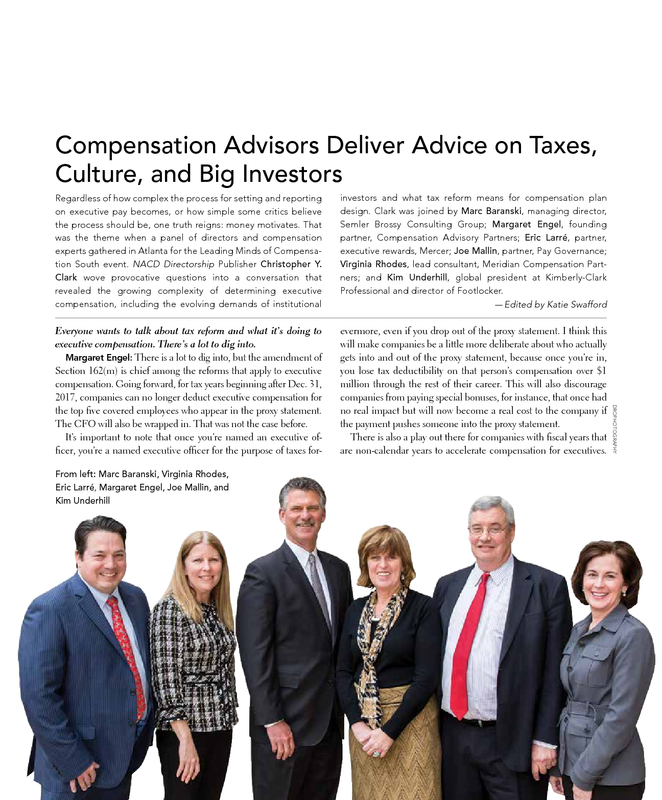 NACD Directorship Publisher Christopher Y. Clark wove provocative questions into a conversation that revealed the growing complexity of determining executive compensation, including the evolving demands of institutional investors and what tax reform means for compensation plan design. Clark was joined by Marc Baranski, managing director, Semler Brossy Consulting Group; Margaret Engel, founding partner, Compensation Advisory Partners; Eric Larré, partner, executive rewards, Mercer; Joe Mallin, partner, Pay Governance; Virginia Rhodes, lead consultant, Meridian Compensation Partners; and Kim Underhill, global president at Kimberly- Clark Professional and director of Footlocker. Everyone wants to talk about tax reform and what it’s doing to executive compensation. There’s a lot to dig into. 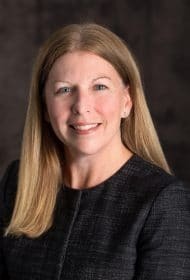 Margaret Engel: There is a lot to dig into, but the amendment of Section 162(m) is chief among the reforms that apply to executive compensation. Going forward, for tax years beginning after Dec. 31, 2017, companies can no longer deduct executive compensation for the top five covered employees who appear in the proxy statement. The CFO will also be wrapped in. That was not the case before. It’s important to note that once you’re named an executive officer, you’re a named executive officer for the purpose of taxes forevermore, even if you drop out of the proxy statement. I think this will make companies be a little more deliberate about who actually gets into and out of the proxy statement, because once you’re in, you lose tax deductibility on that person’s compensation over $1 million through the rest of their career. This will also discourage companies from paying special bonuses, for instance, that once had no real impact but will now become a real cost to the company if the payment pushes someone into the proxy statement. There is also a play out there for companies with fiscal years that are non-calendar years to accelerate compensation for executives. This won’t be appropriate in every situation, as taxes don’t and shouldn’t drive every decision. For named executive officers, you have the ability to deduct this year on a blended rate. So, if you are a March 31 company, you would pay nine months of taxes at the 35 percent rate and three at the lower rate, making your effective rate for this year 31.5 percent. Next year you will be taxed at 21 percent. To the extent that you accelerate compensation into the end of fiscal year 2018, your company would have a tax benefit of 10.5 percent on that compensation. That’s a big incentive. You can accelerate compensation by approving a bonus by the end of the year. This can be a little risky, as the audit isn’t completed yet, but you should be comfortable with 11 months of results to where you can fund a certain bonus. I am sure a subset of companies will take advantage of these techniques. After all, they did the last time that taxes were reformed. Simply be straightforward about it in your proxy statement. Institutional investors seem to be influencing pay programs. How are they tipping the scales? Eric Larré: Over the past couple of years, investors of all walks have displayed an increased focus on performance measurement: institutional investors, private equity firms, shareholder activists, and I’d even lump in the proxy advisory firms. They each have a slightly different perspective, but they all seem to be focusing less on the actual metrics and more on the objectives being set. Activists are focused on capital efficiency and balance sheet strength. Private equity firms are focused on operating income and cash flow metrics. It would behoove all directors to look at the composition of their respective shareholders to project what they ought to be focusing on. In a study last year of sitting S&P 500 CEOs who had been in their roles for five years, our team found that the majority of executives were receiving above-target bonus payouts while there was also a declining trend in revenue and earnings growth. Payouts under the bonus plans were staying static and above target. I believe this is a reflection of the fact that the economic environment changes, and your committee has to be responsive to what can be projected about performance going forward, and not simply thinking that one can only earn more if the company does better than the preceding year. We encourage our clients to look at public disclosures to backtest the structure of their incentive plans and test how much stretch there is in their own company’s objectives. One client of mine was convinced that they were not paying enough to their executives for the performance generated. The board was very conservative and was using a plan that had been in place for 10 or 15 years; that plan had set a very high standard very early on. We took a close look at competitors and determined that the company was paying below target bonuses while being in the top quartile across every measure in their peer group. We were able to advise the board that they were not paying based on their own pay-for-performance philosophy. After some of the bad governance events in the early 2000s, at the board level there was what I’d call an unhealthy shift to completely formulaic incentive plan designs. If one had a formula to point to, like the board I just referenced, you’d think you were all set. That said, directors and compensation committee members are there to exercise judgment on what performance really is, and institutional investors and advisory firms have the benefit of 20/20 hindsight. Goal setting is an elusive art at best. Boards and committees should avail themselves of the discretion they have to assess performance with full knowledge of all facts and circumstances. How should incentive design shift during times of disruption? After all, the bull market won’t last forever. Virginia Rhodes: You’ve hit the nail on the head. When things do start to trend downward, or when your company finds itself in the lower quartile of performance, what do you do? It just takes one year of lesser performance to put your pay plan in the hot seat. How do you proactively prepare? If you’re not engaging shareholders, start tomorrow. You don’t want to be in the position where your pay-for-performance vote has performed poorly or failed and you have no relationships to fall back on. Directors might be asked to join management in conversations about those pay choices, so being prepared with a message about how pay choices were tied to overall business strategies is important. Your board may struggle with how to do the proper due diligence to explain your company’s decisions based on business strategy and the impacts of externalities. Boards have to realize that no one has as much information about performance as the management team of the company. Boards need to be asking for information on the thought process behind the development of strategic goals that are tied to their performance. How are they thinking about annual and long-term incentive measures? How were those selected? I encourage clients to have these conversations throughout the year in order to be prepared with the right information by the time the review of goals comes around. I would seek out the history of goals set over the past five years, and the past ten years for cyclical businesses. You’ll want the targets as well as the range around those targets. This will give your board insight into whether they’re growing above and beyond targets or falling behind, and can determine if goals are too lofty and management has been a little tough on themselves given operating environment changes. I also would consider peer performance. It shouldn’t guide what your numbers are going to be, but peer performance informs how difficult things might be in the competitive landscape. How are compensation plans shaping culture—or is it the other way around? Joe Mallin: I have several clients where culture played a significant role, but I’ll stick with two. The first is a large company with between 40 and 60 business units, all very entrepreneurial in nature, primarily because decision making was pushed down to the unit heads of each business. When we were brought in to redesign their annual incentive plan, we noticed several issues that hadn’t been addressed in a few years, including the fact it was a prescriptive plan that didn’t really match their entrepreneurial culture. They had four or five performance measures to hit to get their annual incentive payouts, which actually bound their freedom to make the right business choices for their unit, and they were losing some of the entrepreneurial impact of their structure. We did something very simple: we blew up key aspects of the plan. We asked the company to consider paying business unit heads based on a profit measure specific to their industry. That’s it. It became an “aha” moment for the business unit heads, senior management, and the compensation committee alike. They all realized they were taking away an impediment and replacing it with incentives to match and reinforce their entrepreneurial culture. That was a fun engagement, but I’ve also found that when you’re designing an incentive plan with culture at the center of it, the environment can become difficult to operate in, as you have all of the issues related to incentive design coupled with whether or not the design will positively impact the culture. This means that it takes at least twice as long to design the plan in the context of those cultural considerations, particularly when there is a strong culture in place. Another company we worked with wanted to do the opposite. This company, which is a consumer products company, previously had an incentive design that would pay for corporate results but not individual results. When new management came in, they decided the company’s culture needed a change, and realized the old incentive design plan did not drive individual accountability. We took a clean sheet of paper, decided who would be paid for what business results, and brainstormed which operational measures we would use as a measure of success. We did the opposite of what was done at the first company, as we pushed the incentive plan design changes back into the company’s culture. Borrowing from our beloved Shakespeare, I have to ask, is there much ado about nothing when it comes to pay ratio reporting? Marc Baranski: Well, it certainly is here, in spite of everyone hoping that it would disappear. Based on what we have seen so far, the less-is-more approach is taking hold. People are matter-of-factly reporting what the ratio is. Companies are indeed considering internally whether it will be an issue for their own company, and for what reasons, and are working to proactively get ahead of any possible issues with employees, for instance. Many people forget the fact that the CEO’s pay is not new information. However, the disclosure of median employee pay is new information that we think will catch some companies off guard. The median pay of the median employee can emerge as an issue in two ways. First, everyone below the median at that company may realize that they’re paid below the median and ask why. Internal communication and engagement needs to be planned for. Another issue is relative comparisons of one company against another. We have a client in a relatively small city that has one competitor in the same industry in that city. They’re worried about what the median pay is across the street because it could cause some serious talent retention issues at the middle management level. I think that external attention to the matter is going to be varied, and one concept to anticipate and prepare for is how the proxy advisors will report on it. They have stated that at first they will not comment on the ratio. However, once a number is a printed item, it can be compared, sliced, and diced. Companies should consider scenarios that could present a red flag to proxy advisors, such as a dramatic change in the ratio from year to year, or a ratio that’s very different from competitors. While there could be very good reasons for the differences, such as a large workforce outside of the United States or different workforce segmentation, it would serve your board well to be prepared to communicate about discrepancies. How do you keep up with the latest developments, trends, and nuances in executive compensation? Kim Underhill: You have to be an unbelievably curious learner. I think getting properly acclimated to your company’s specific situation starts with an awesome onboarding plan. You need to be connected with the right people—get time with the CEO, human resources, advisory councils, to understand some of the history on how the company arrived at where it is now. I think it’s also important to understand management’s philosophy on compensation and how it compares to the board’s perspective. As a new director, I talked to the compensation chair and committee members at my company where I am an executive. I wanted to get their perspective. It was really insightful and helped me tie the pieces together regarding varying approaches and philosophies on compensation. Since starting, I’ve set up alerts for news on compensation. It can really help you identify both good and bad examples. I also attend NACD’s events related to the compensation committee. I have learned a new vocabulary and seek out learning opportunities across all available resources.